Successfully Added Solar Powered Digital + Analog Watch to your Shopping Cart. Solar power watch with digital and analog time displays. Yes, that is no typo, this watch has two different solar powered displays built into one watch! A standard analog display with hour, minute, and second hands, and also a digital display with hour, minute, second, and date display. 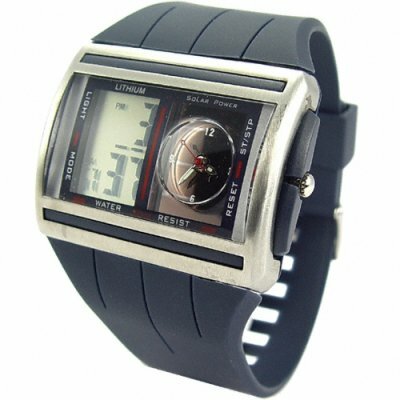 Of course no digital watch would be complete without great features like stopwatch, alarm, and calendar functions. The CVSCV-9100 has these features and more which are easy to access with the big easy press buttons on the sides of the watch. Best of all, this is all powered by the sun, with a small lithium battery held within the watch to store power. This unique watch is available to you from Chinavasion at a great wholesale prices with no M.O.Q. (no minimum order quantity). A profitable resale item, start selling today and use our excellent drop shipping service to maximize your limited resource of time. Solar powered watch with digital and analog displays. Digital features like stopwatch, alarm, and calendar.